A Girl Called Erika: Last But Not Least: Bandit! Good day to you! Guess what? I think it is time to discuss the third feline that lives in my house: Bandit. Yes, indeed. Boyfriend got Bandit because he looked awesome. Not kidding. He went to Petco, where one of the Pittsburgh animal rescue groups has an adoption area, saw Bandit and bought him. Can cats be considered impulse buys? This one can. 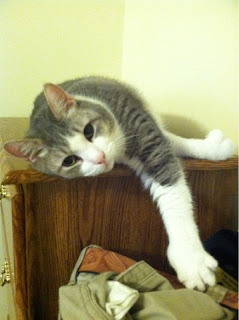 -He is a Hemingway cat (aka polydactyl). He has extra toes on all of his feet (pretty sure, last time I asked, Boyfriend said Bandit has 24 toes). More on the back feet than the front, I think. You can sort of see some of the toes in the picture. -He only recently learned how to make a sort of meow. He normally makes a noise that can best be described as a "brrr." -He sometimes bites my hair while I am asleep. -He loves to carry his toys around the house and give them to me. -He loves my kitchen rugs. I hope you enjoyed reading about my crazy gatos. They sure keep me busy. I don't mind. It's nice to have a little warm, purring creature to sit with.